Fly almost enter my mouth when I see this this picture! Ewooooo! (Claps hands) So amother can flabberscatterbuster her own child like this?? The pikin be like wetin tractor jam! What manner of attrocity could this smallie have committed to earn this? In reaction to this story, people are asking boya it is right for parents to discipline (flog) their kids. Please note, this woman's case is different. This was clearly not discipline but witchcraft. I do not think a normal mom would do this. Don't get it twisted, children should be disciplined but not abused. I wouldn't say that a majority of us were flogged, I can only speak for my self. Me I was flogged! And it was good for me. The fear of koboko was the beginning of wisdom for me. Children need discipline sha, a little smack on the bumbum will not kill them, even a knuckle sandwich might actually do them good. Parents also know how to give THE LOOK of which say THE LOOK only works when the child knows the Koboko waiting at home. In fact, let me share with you guys the punishments i'm very familiar with. 'Pinch' is usually used in public places by mothers when THE LOOK hasn't worked. 'Konk' aka 'iko' 'aka' knuckle sandwich. I received loads from cousins, uncles, aunts....it came free! 'Omorogun' aka wooden spoon for making eba. Omo! that thing flies! 'Ruff Ryder' na when you position yourself like okada man wey dey ride bike. E dey pain! 'Pick Pin' please, don't tell me y'all didn't pick pin?bending and balancing on one finger and leg while raising the other. 'The belt'' No explanations are needed for this one. Na fathers dey dish am out pass. 'Koboko' is the master of ALL punishments! It fit make you confess ogbanje, or things wey you nor do! The sight of the koboko alone dey make me comport! Shun sir! At least you chopped one of these punishments if you grew up in Naija, I have no comments to the Aje burra's that grew up in obodo oyibo wey dey call police for their parents.SMH. Spare the rod and spoil the child. There is a difference punishment and Child abuse. I did not say people should go and injure their kids oh! Don't get it twisted. It is rather sad that she went this far all in the name of...discipline? Na wa oooo! to her own child??? Heard there is a new law/bill to be passed in lagos state concerning parents/teachers /guardians marking their children/students/wards in the name of discipline. This one is just over the top. Yemisi...you are right, she be proper winch. My mum is a good slapper, if she slaps u, u will be counting stars beause your eyes will just change to that of a microscope. My dad used belt, mehn...he will use all his energy. LMao. the worst one that both of them used is cAlled 'olomo ku'ya' basically 'stand up one second, bend ur knees the next second (kuru ga). that one was painful ehn! Eya poor boy..I hope parents learn that there is a thin line between discipline and punishment..
Sisi I go all the above mentioned oh..I am glad cos my head correct at the end of the day..:)I can say mine was a case of discipline cos mehn my strong head was next level.. This is sad. so so sad, she took it to a totally different level. e don pass discipline this one na abuse. omo, i had all of the above listed punishment typos ! i was quite a handful then :). mehn that woman sha no try at all, what sort of anger and frustration will make one go that far ehn? Any punishment that opens the skin and makes a child bleed is child abuse. Even if it doesn't do this, if it becomes too frequent, comma don enter am. My parents used timeout, kneeling, slaps and cane on the palms or buttocks. I hope I don't have to do the last two but I believe in discipline. Kai! some parents sha. dis is 2 much abeg. reminds me of an incident in my estate. a little boy was kneeling in front of his house under the very hot sun wit his hands up n all. i thot he ws being bullied by some older kids or his siblings. i ws ready to konk somebody. omo wen d boy tell me say na im mama tell am make im dey dere till night. i jejely waka. but for real tho. some kids don't really understand punishment. my sister was rarely beaten as a child. der was something very fragile n 'dont touch me i might faint' about her. it annoyed me 2 no end. however if my sister was ever joined in d flogging..... e mean say death to everybody else. my father's floggin was SAVAGE!! n no you were not allowed to cry out. you had to 'jide onu gi aka' (hold ya mouth). woe betide u if u even attempt to run. My mum used broom o,basin,comb,hand(pinching,knocking etc) anything she reach... But she never scared us and opened our skin abeg,this is inhuman.... Too many women pray to have a child but some treat theirs like they didn't carry for 9 months? Haba... Abeg oh! I was koboko-disciplined until I turned 14. 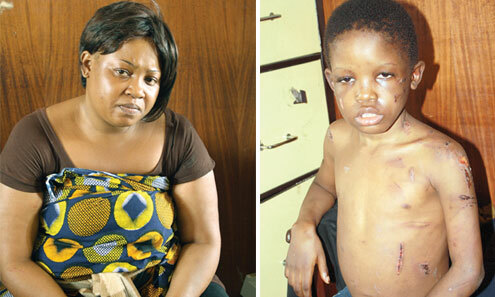 But what this woman did to her son is beyond discipline. It is wickedness + witchcraft + hatred for her own flesh n blood. Na wa! I go with Ema Leecious on this one,the punishment shouldn't be more than the crime,ah ah,she should be arrested jor,maybe she's not the real mother sef.that is bad and wicked.i can't do this ,my parents didnt ever think of it. ....so ANGRY!!! !....6strokes of the cane or slipper on his hand or bottom is enough!....he should become Govt ward, so that she can have ALL the time for her new husband oshi!....mschew.... slept under the staircase?????? ?.....what manner of heartlessness is that???. This is rather sad and un-called for! This Discipline went too far and beyond. Parents have to be careful when it comes to things like this. This child is physical wounded and even mentally wounded. I hope he doesn't resent his mother for this. Anyways...I hope the boy heals quickly. Pampered lastborn like me I only got a folde newspaper slap on the palm from my father, two slaps from my mom and numerous knocks from my evil (I still love him) elder bro. 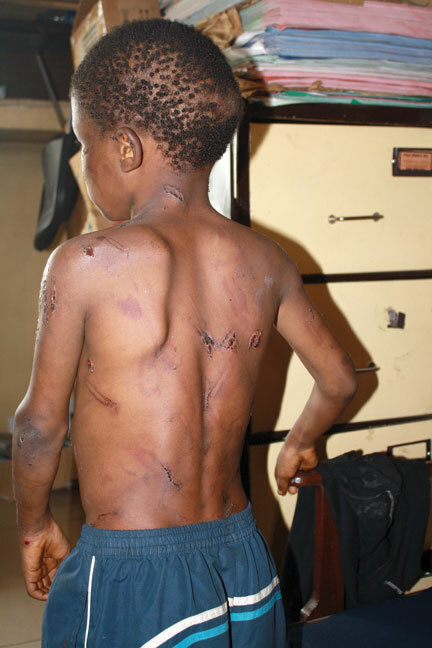 This is wickedness, how can you beat your child to this extent? About the punished i received as a child... I received alot i mean alot of abaras from my mum. But the woman went too far sha. Although, I do not believe in flogging a child (I adapt other forms of discipline) my mother did not spare me o! :) She flogged when she had to; pinched me, gave me plenty "abaras" but she never left any mark on my body! This is pure wickedness!!! The woman is a winch sef! I've received THE LOOK (my mum's favourite - lol), whilst the belt awaited me at home if THE LOOK failed. And mummy didn't leave it to daddy to dish it out o. LOL! Yes, I got punished for bad habits when I was young but mine was never this horrible.. Mehn, this one is just threemush! haba! 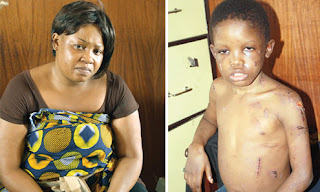 Some women do not deserve the title 'Mother', I tell you...what is this?Wetin dis kind small pikin go do wey ei go deserve the kind beating wey dem di give thieves in the market.THat mother doesn't just need counseling, she needs a taste of her own medicine! and maybe a jail sentence. I guess I was a good a good kid (ha!) the maximum punishment I got from my parents was- a little twist on my mouth to make me shut up. But got loads of spankings, slaps and knocks from my big bros (i guess for telling on them)- not funny at all. As a mum, I believe in dicipline and uses what works best on my kids- 'the almighty naughty corner', yea a pinch in the public. you know, dont delay the dicipline, dish it out immediately hence you become a bad mum. My spouce loves the koboko, that scares the living day light out out me. God help my babies bombom. Amen! lol. you killed it as usual. I ran down when i saw the pictures o! gross! Its soo sad....me thinks she's probably going thru some stuff and is taking it out on the child.....my heart goes out to the little boy...Wat won't i give to wave a wand and have all this sort of stuff come to an end in this world of ours! ok! dis one is on a different level now..it is the height of mutilation and grievous bodily harm.They need to get the poor boy out of her reach. My mum had dis sharp, fast, slap that comes when you aren't expecting (just one that she gives!..0)...it leaves you a little dazed/confused with stars floating round your medulla. Yo! I was a naughty child. I received all of the freaking above. Except the jeje punishments though. My own jeje was Kneel down, raise your hands, close your eyes. And they look alike o. So sad, a lot of parens still do this. My mum was a complete disciplinarian and her cane left marks o. I even sometimes think she overdid it but a lot of parents did, anyway. This woman is nothing but a PILOT wey dey fly for night! Abeg make una look her face well! How could u do this to your own flesh in the name of punishment? I guess she dey find Suya wey she and her gang go eat for night when dem take their FLIGHT! Yeap I was beaten by my parents but nothing like this! I think everyone agrees this is just abuse on top of abuse. For me, I got a stick (switch) to the palms (sometimes all over the body - reserved mainly for top offenses) or a dirty slap (very rarely though from mom). But I believe in discipline...not abuse. The woman must be frustrated to beat up her child like that. My parents never spanked me, but my mother can shout and she says all sorts of scary things to instill fear into us.I believe in discipline and I use timeouts on my kids when they fall out of line. I apply pinching sometimes when we are in public and they are misbehaving. i got corrected as a kid and its made me a better person today.but this is some ish mean this woman is just totally insane i can tell. Reminds me of 'A Child called it'. This woman should be publicly flogged. I rarely got disciplined as a child. I was unadventurous and rather timid. However, I came home at 6:30pm instead of 6:00pm from a party (I had to leave when it was just beginning) to find my mother waiting for me at the bus-stop with her lashing apparatus. I have never run so hard in my life! The picture of this child made me feel nauseous when I first saw it. With my kids, I prefer to use other forms of punishment. Smacking can be too easy and it can lead to unwanted injuries - especially when carried out in anger. i got this at work ystdy & this was what i replied to all..."There’s a thin line between discipline & abuse, but for the case of this 10year old boy & his mother, I pray she is prosecuted and thrown in jail. Likewise all you women, our wives, mothers, sisters & people who maltreat & physically abuse their dependants (kids, step-kids, nannies/house-girls) alike, so it will serve as a deterrent to those coming behind"
Babes you are clown o..I love this. You know the other day I was argueing with someone on this issue. Her husband who allegedly declared that he did not want the boy around and then took off to SA until she dealt with the "problem" nko? When men say things like that, I wonder if they cannot make the connection that if a woman would treat her child by another man in such a manner she can easily do the same to your own child by her. I did an entire post on how my mother no dey take abara joke on my blog in 'abara toh bad'. My momsie na olympic gold medalist for abara and hot, dirty slaps. Yup, a two event champion. But nothing remotely close to this. She wan kill the boy? Na im betray Jesus?? This is much too much and she should be jailed. This has gone from discipline to terrorism. The above sect has not only men, there are sick females involved as well. So, do not trust your nice looking neighbour, just because you cannot imagine him or her to do such things. Be weary if your child changes in behaviour. Child abusers should be brought to justice.